According to some specialists, Comet ISON appears to have survived a close encounter with the Sun that had threatened to vaporize it. The remnant could now go on to be visible from Earth in December, but astronomers do not know how bright it might become. Travelling at more than 200 miles per second, ISON passed 730,000 miles above the sun’s 6,000C surface on Thursday evening. This would have heated the comet to almost 3,000°C, enough to vaporize rock as well as ice. The hope was that the comet would remain sufficiently bright to be visible with the unaided eye throughout December. However, as ISON sped towards the sun, it faded dramatically from view. This led some experts to assume it had disintegrated. “I’m not seeing anything that emerged from behind the solar disc. That could be the nail in the coffin,” said astrophysicist Karl Battams, from the Naval Research Laboratory in Washington, during a live broadcast on NASA TV. Yet, rumors of the comet’s demise may have been greatly exaggerated. 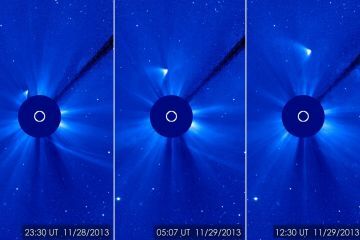 Overnight, something following ISON’s orbit re-emerged on the opposite side of the sun. Now it is brightening as it plunges back into deep space. “To all intents and purposes it looked like it had gone, and then amazingly this thing appears out the other side,” said Professor Tim O’Brien, associate director of the University of Manchester’s Jodrell Bank observatory. “What we don’t know is whether the whole thing fell apart and whether the dust that was embedded within the ice is just basically in a big cloud and that is continuing to orbit,” he explained. The nucleus, a huge lump of rock and ice, was several miles wide on its approach to the sun, and brightened as the sun heated it to create an atmosphere, or coma, of ice and dust which was blown away from the sun to form a tail. But radiation pressure, extreme heat and gravitational forces could have ripped the comet apart. If the remnant is a cloud of dust it will rapidly dissipate. If it is solid the sunlight will continue to vaporize its ice, creating a tail that may be visible from Earth.